The verb "conn" probably stems from the verb "conduct" rather than another plausible precedent, the verb "control". On surface ships, the conning tower was a feature of all battleships and armored cruisers from about 1860 to the early years of World War II. 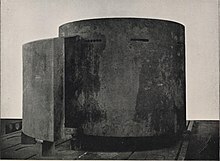 Located at the front end of the superstructure, the conning tower was a heavily armored cylinder, with tiny slit windows on three sides providing a reasonable field of view. Designed to shield just enough personnel and devices for navigation during battles, its interior was cramped and basic, with little more than engine order telegraphs, speaking tubes or telephones, and perhaps a steering wheel. At all other times than during battles, the ship would be navigated from the bridge. Conning towers were used by the French on their floating batteries at the Battle of Kinburn. They were then fitted to the first ironclad the French battleship La Gloire. The first Royal Navy (RN) conning tower appeared on HMS Warrior which had 3 inches of armour. In the Royal Navy, the conning tower became a massive structure reaching weights of hundreds of tons on the Admiral-class battlecruisers (such as HMS Hood), and formed part of a massive armoured citadel (superstructure) on the mid-1920s Nelson-class battleships, which had armour over a foot thick. The King George V class, in contrast to the Nelson class, had comparatively light conning tower protection with 4.5-inch (110 mm) sides, 3-inch (76 mm) front and rear, and 2-inch (51 mm) roof and deck. The RN's analysis of World War I combat revealed that command personnel were unlikely to use an armoured conning tower, preferring the superior visibility of unarmoured bridge positions. Older RN battleships that were reconstructed with new superstructures had their heavily armoured conning towers removed and replaced with much lighter structures. These new conning towers were also placed much higher in the ship, for superior visibility. There is no evidence that RN captains and admirals used the armoured conning towers on those ships that did have them during World War II, with, for example, Vice-Admiral Holland and Captain Kerr commanding Hood during the Battle of the Denmark Strait from her unarmoured bridge. Even in the United States Navy (USN), battleship captains and admirals preferred to use the unarmoured bridge positions during combat. The USN had mixed opinions of the conning tower, pointing out that its weight, high above the ship's center of gravity, did not contribute directly to fighting ability. Beginning in the late 1930s, as radar surpassed visual sighting as the primary method of detecting other ships, battleships began reducing or eliminating the conning tower. The battle of Guadalcanal during World War II briefly slowed this trend: when the Japanese battleship Kirishima hit USS South Dakota on the superstructure, many exposed crewmen were killed or wounded yet Admiral Lee and Captain Davis of USS Washington declined to use the armoured conning tower during the battle. Soon the heavy battleship conning towers were removed from USS Pennsylvania, USS Tennessee, USS California, and USS West Virginia during their post-Pearl Harbor attack reconstructions and replaced with much lighter cruiser-style conning towers. By the end of World War II, US ships were designed with expanded weather bridges enclosing the armored conning towers. On Iowa-class battleships, the conning tower is a 17.3-inch (439 mm) thick vertical armor-plated cylinder with slit windows located in the middle of the bridge, climbing from deck 03 all the way up to the flying bridge on 05. With the demise of battleships after World War II, along with the advent of missiles and nuclear weapons during the Cold War, modern warships no longer feature conning towers. The conning tower of a submarine was a small watertight compartment within its sail (or fin in British usage) equipped with instruments and controls and from which the periscopes were used to direct the boat and launch torpedo attacks. It should not be confused with the submarine's control room, which was directly below it in the main pressure hull; or the bridge, a small exposed platform in the top of the sail. As improvements in technology allowed the periscopes to be made longer it became unnecessary to raise the conning station above the main pressure hull. USS Triton (laid down 1956) was the last American submarine to have a conning tower. The additional conning tower pressure hull was eliminated and its functions were added to the command and control center. Thus it is incorrect to refer to the sail of a modern submarine as a conning tower. ^ conning definition on Dictionary.com; see Origin section under definition 3. ^ "The Conning Tower". The Spanish–American War Centennial Website. Retrieved 3 January 2019. ^ a b c Lambert, Andrew (1987). Warrior Restoring the World’s First Ironclad. Conway maritime press. pp. 149–150. ISBN 0-85177-411-3. ^ Raven and Roberts, British Battleships of WW2, p415: R&R also state: "Another feature of interest is the retention of the heavily armoured conning towers in the American, French and German navies. These structures were of little use and added considerably to the top weight and weight of armour. That of the Bismarck certainly seems to have done little to protect her officers, communications and fire control arrangements, all of which suffered heavily in the early stages of her action with KGV and Rodney." ^ Morison, S. E. History of United States Naval Operations in World War II: Operations in North African Waters, Volume Two, p93. On November 8, 1942, USS Massachusetts came under fire while engaging Vichy French naval units and shore batteries: "Throughout this action, heavy stuff was whizzing over Massachusetts and splashing in the water close aboard. Admiral Giffen and Captain Whiting disdained the protection of the armor-cased conning tower, and directed the battle from the open flying bridge." ^ U.S.S. North Carolina - Action of August 24, 1942, report of. : "21. Ship control was maintained in the Pilot House on the Navigation Bridge where personnel were in an exposed position. This was necessary in order to keep station on the Enterprise, guide of Task Force Sixteen, while that vessel maneuvered radically without signal at twenty-seven (27) knots during the attack. Due to the limited visibility aft, handling the ship under such conditions from the Conning Tower is not practicable." ^ Musicant, Battleship at war, p118. Captain Davis of USS Washington and Admiral Lee fought 2nd Guadalcanal from the unarmoured bridges of their battleships. Musicant makes reference to South Dakota Bridge personnel observing the battle but remains silent on their use of the armoured conning tower. Look up conning tower in Wiktionary, the free dictionary. "Conning Tower" . The New Student's Reference Work . 1914. This page was last edited on 27 February 2019, at 16:12 (UTC).